In the days leading up to today's (Oct. 9) announcement of the 2012 Nobel Prize in physics, speculation was rampant that the discovery of the Higgs boson particle would be rewarded this year. This summer, particle physicists at the world's largest atom smasher, the Large Hadron Collider (LHC), announced they'd finally found what looks to be the Higgs boson after decades of searches have turned up nothing. Recently, rumors started flying that the 2012 Nobel would reward either the teams responsible for the discovery, or the scientists who predicted the particle's existence almost 50 years ago. Today, the Royal Swedish Academy of Sciences announced that this year's Nobel in physics was awarded to French physicist Serge Haroche and American physicist David Wineland for their pioneering work in quantum optics — the study of the fundamental interaction between light and matter. Why no glory for the Higgs? "It was too early," said Nobel laureate George Smoot of the University of California, Berkeley, who won the 2006 physics prize with John Mather for their work on the cosmic microwave radiation in space left over from the Big Bang. Their findings came from measurements made by NASA's COBE satellite after it launched in 1989. Scientists predicted the existence of the Higgs boson in the 1960s to explain why other particles have mass. The particle is thought to be associated with a Higgs field pervading space that bestows mass on particles the way wetness clings to kids who swim through a pool. 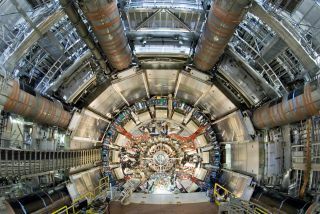 This year, two experiments at the Large Hadron Collider had amassed enough data to prove that a new particle had been created with the properties predicted for the Higgs. Yet, physicists can't say for certain yet that the particle is definitively the Higgs boson. Still, some thought the find might be enough to finally reward the Higgs predictors, including Peter Higgs, the 83-year-old theorist from Scotland's University of Edinburgh who forecast the boson's existence in 1964. Others suggested the teams behind the LHC's recent find should be honored. Columbia University physicist Peter Woit suggested the Nobel committee break with tradition and award the prize to organizations, rather than individuals, to recognize the teams behind the particle accelerator (run by the CERN physics lab in Switzerland) and its two main experiments, called ATLAS and CMS, that found the particle. "If there really is nothing but custom to keep them from awarding the Nobel this year to ATLAS, CMS and CERN for the Higgs, I can't see a better occasion to break with the custom, and they've had a long time to decide whether or not to do this," Woit wrote yesterday (Oct. 8) on his blog. "So, here's a (probably wrong…) prediction for tomorrow: ATLAS, CMS and CERN as Nobelists." Some universities even put out press releases in advance offering journalists access to their Higgs experts in case the Nobel this year went to a Higgs scientist. Perhaps another year will be enough to show the LHC's particle really is the Higgs. "The announcement was of a Higgs-like particle and the current LHC run was extended to try and determine more of the Higgs-like particle's properties so that one could begin ascertaining if it really is the long-anticipated Higgs," Smoot told LiveScience. "It probably will turn out to be, but it is too early to be sure." Furthermore, the summer timing of the LHC announcement simply may have missed the deadline for this year's Nobel prizes. "The discovery announcement came too late," suggested Frank Wilczek, a co-winner of the 2004 Nobel Prize in physics for his work on the strong force that holds atomic nuclei together. "Nominations formally close on February 1. There are ways to stretch the rules, but evidently the relevant decision-makers felt that there was not sufficient reason to do so in this case." Wilczek emphasized that he has no inside information about the Nobel decision process, but said, "I think an award for Higgs particle theory is the odds-on favorite for next year." Mather, an astrophysicist at NASA's Goddard Space Flight Center in Greenbelt, Md., said he had "no real idea about why the Higgs boson didn't win this year," but that the workings of the Nobel committee will ultimately be revealed. "Wait 50 years for the Nobel archives to be opened up for inspection." This story was provided by LiveScience, sister site to SPACE.com. You can follow Clara Moskowitz on Twitter @ClaraMoskowitz or LiveScience @livescience. We're also on Facebook & Google+.